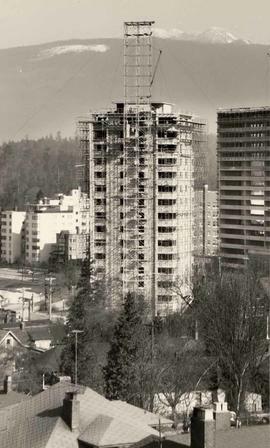 Photograph depicts the Berkeley Tower of Ocean Towers in Vancouver's West End, near completion.Sixteen storey concrete apartment building surrounded with construction scaffolding in centre of image; intersection and parked cars in foreground. 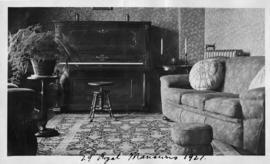 Photograph depicts seniors apartment building B'nai B'rith Manor. Colour Kodachrome 35mm slide depicts a high-rise that has a curved structural element and has many balconies. The image is taken from a balcony in the building. Colour Ektachrome 35mm slide depicts a street lined with residential apartment buildings.Note: Colour adjusted on jpg.